Is Concrete the New Standard for Patio Floors? Concrete patios are becoming more and more popular nowadays to homeowners in the US. 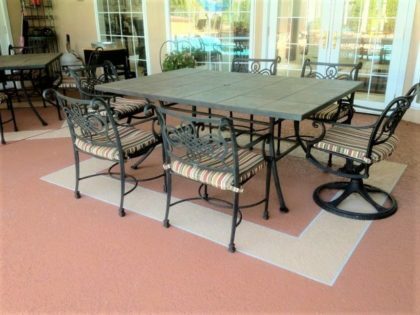 This is because as technology advances, the one-trick pony in surface materials has now become the king of decorating elements for patio floors. It has probably overtaken wood, pavers, stones, and tiles in popularity. Its design options have increased tremendously while its cost remained reasonable. This has attracted both residential and commercial property owners in last couple decades. It’s versatility in design really earns the crown for people looking to dress up their tired looking patios. But is it safe to consider it as the new standard material for patio floors? Is the cost worth it, or does the cost of repairs, in the long run, offset the low installation cost? Is maintenance a breeze compared to other materials? Does it deliver the wow factor and satisfying aesthetics? How long does it last compared to other paving materials? Does it offer better features? An average stamped concrete patio would cost between $3 to $15 per square foot. This is way below the cost of natural stones and a bit lower than most bricks and other pavers, but just about the same price as wood. With wood being high maintenance and less durable to scratches and weathering, wooden patios require sealing or painting regularly to keep moisture and dirt from penetrating its pores. Repairs on wooden patios can become costly over time. So concrete wins here. Some pavers are economical and are good alternatives to concrete, but they may require a little bit more maintenance. You might need to reset them every few years, as shifting sands and particles underneath may cause them to sink in certain areas and become uneven. Roots and weeds can easily intrude through the spaces between the pavers, so you might need to use weed killers every now and then. Due to these crevasses, it may be harder to clean pavers as dust and dirt can get stuck, and power washing them can destroy the sand layers underneath, causing more problems in the future. The color die vary in strength from pallet to pallet so a lot of care is needed when installing pavers. Concrete patios don’t have joints. It’s all in one piece and the sealant on top keeps it free from moisture and dirt, so you can just mop it regularly to keep it clean and the colors vibrant. Resealing based on contractor’s recommended timeline is a good way to keep the colors vibrant. With stamped concrete or even stained concrete in the picture, concrete offers a more ornate and versatile design. It can match the colors, patterns, and designs of surrounding materials. It can copy beautiful natural stones and other pavers that cost so much more. Of course, nothing can beat an original material. But with a skilled professional, your patio transforms into a canvass and this can result in a really stunning and gorgeous concrete patio. Wood and pavers have their own charm too. But concrete’s versatility is what seems to catch most homeowners’ attention. We know that concrete is tough. But how long does a concrete patio last before needing repairs and replacement? Concrete is tougher than wood and asphalt. Proper installation of concrete patio can make it last for decades. Certain intrusions from the environment, like tree roots, or shifting of the earth can cause cracks on any concrete patio. Once it develops tiny cracks, have them fixed and patched up right away to prevent bigger problems from occurring, as professionals can reveal the cause of these symptoms. Stamped concrete patio has more protective coatings, like color hardener and sealant that protects it from abrasions and elemental damage. Without proper maintenance, we can safely say that pavers can easily outlast concrete. But with proper care and maintenance, concrete can match pavers in longevity. Can it offer better features? Concrete can be added with slip-resistant and heat-reflective additives that are very useful for areas like pool decks and patios. But some natural stones and pavers with special coatings also have slip-resistant textures and heat absorbing qualities. So these features are not exclusive to concrete. It would all boil down to cost for practical homeowners. Although the concrete patio may not necessarily be the valedictorian in every category, it beams solid numbers in every department. Put value into perspective, and it rises above the rest. Add proper maintenance and care to it, and it will give you satisfaction that lasts a long time. It’s no wonder it has been getting more and more approval from homeowners everywhere, paving way for the new standard patio floor material.